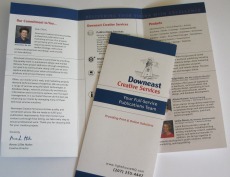 Downeast Creative Services - Your full-service creative team! Organizations today often must work smarter to develop and market their products and services efficiently and cost effectively. Whether large or small, clients demand creative services that are responsive to their individual needs and resources. The core skills of Downeast Creative Services are: marketing strategy, publications design and execution, and web development. Our strength is the scope of our experience in each of these areas and our ability to creatively integrate them in response to our clients' needs and resources. From brand identity to market and publications strategy through print and web delivery, our goal is to define and deliver your vision with excellence. Downeast Creative Services is committed to providing excellence in publications design and market delivery. From project definition through completion, we work to communicate clearly with clients so as to understand and implement your expectations for the products and services that you create. We will review the effectiveness of current marketing strategies closely with you, including your publications and marketing programs to articulate a campaign that is consistent with your overall business plan. In addition to carrying out market research, we can help you to define the scope and budget for proposed projects, developing creative options that match your overall objectives and resources. DCS offers significant experience with a broad range of publications and marketing challenges. As an integral step of any creative program, we take full responsibility for efficient project management and execution. Part of this plan involves careful and measured analysis of results. This level of care helps to assure the success of current and future marketing endeavors. We comprise a small staff of experienced creative, technical, and marketing professionals working together with broad expertise to manage diverse client projects. For a profile of our members, see DCS Team. We enlist the talents of a wider network of writers, direct mail and graphic artists, web developers, book designers, illustrators, typesetters, instructional designers, as well as editorial, IT and other technical staff. Each brings dynamic skills and experience to the team, allowing us to manage projects of diverse scope simultaneously.